These activities help students develop proficiency with basic facts. Use the decks for whole class practice or let small groups play as a center activity. Read more about Who Has? decks and how to use these resources to help students develop proficiency with basic facts. These problems were written by Tammie Holcombe and Karen Zeigler, second grade teachers at Port Monmouth Road School in Keansburg, NJ. These assessments were designed to provide scaffolded early-year practice for second grade students to develop proficiency in answering open-ended questions. The problems were created in sets of two similar problems so that teachers might model one problem with the class and then have students solve the other independently. Teachers might also use one problem as a practice problem and add the other problem to a test to simulate state testing. Digit Game - 1 challenges students to form the largest number possible using the three digits each player has drawn. Students must identify the winner of the game and explain how they decided who won. Digit Game - 2 is similar to Digit Game -2 and can be used for additional practice. Ice Cream Treat addresses coin combinations and making change. Pizza Treat addresses coin combinations and making change. See more Grade 2 Problem Solving tasks. 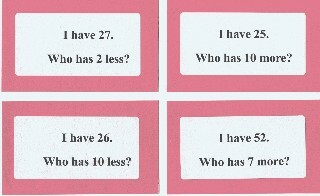 This deck was designed to help students develop fact power with doubles facts. The deck includes extended facts because if students know that 2 + 2 = 4, they should use this to know that 20 + 20 = 40 and 200 + 200 = 400. Proficiency with doubles facts enables students to use doubles + 1 and doubles - 1 strategies as well.